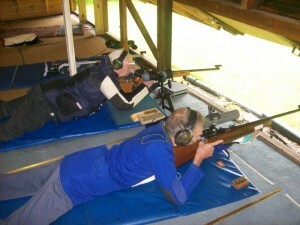 This month, we take a look at the work of North Walsham Rifle & Pistol Club in Norfolk….. The UK has the toughest gun regulations in the world – and that explains the safety of the sport in this country. Each new member joins NWRPC as a probationer. After six months (and at least 12 shooting sessions), the probationary member graduates to full membership on condition that two committee members declare that he / she is safe to shoot. The new member must then sign to say that he / she has read and understood the range rules, which are displayed on a wall in the clubhouse. Below the range rules is the signing-in book. Every member must sign in and out on every visit. This is not only a security measure, but also a record that can be referred to in the event of a new licence application – evidence of regular shooting is an advantage to an applicant. 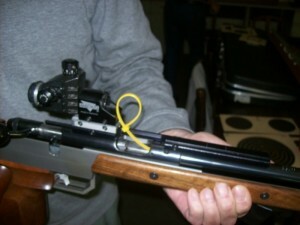 The NWRPC offers three types of shooting. The .22 target range has 10 firing points (two of which are designed for disabled users) at 25 yards, 50 metres, and 100 yards. (The discrepancy in measurement is a shooting convention.) The air range, with 12 firing points, offers sporting knock-down targets at 40 yards and 70 yards, as well as 10-metre air rifle and air pistol competition shooting. There is also a 25-yard black powder pistol gallery. Competitive spirit is lively at this club. Some competitions (Norfolk County League, Bedfordshire League, Perthshire League, Somerset League, Hendon League, Eastern Region League) are conducted via mail; participants shoot at pre-labelled targets and send away these targets (score cards), which must be signed by an independent witness – in most cases another club member. Charles Cain, 73 (and I must stress – a young 73), is an experienced competitor and coach. In the 1980s, he won the English Championship, and won a silver medal for England in the Commonwealth Games. The weekend before I visited the club, Charles had won the Norfolk Summer Championship in Corpusty, a competition that consisted of 80 shots: four targets at 50 yards, 10 times, and four targets at 100 yards, 10 times. Mike Kirkham came third. 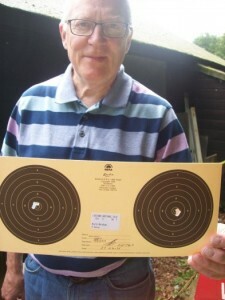 Fabian Halstead (club Treasurer) told me that shooting competitions began about 100 years ago. One of the first trophies in circulation is still around today and has been won, on several occasions, by members of the North Walsham Rifle and Pistol Club. It’s a solid silver trophy, awarded to the individual with the highest score in the Norfolk Winter and Summer Outdoor County Meetings, and is housed in an enormous white cabinet – hence the affectionate nickname, ‘The Fridge’. North Walsham Gun Club receives substantial support from lottery-funded sporting bodies. Active Norfolk is the County Sports Partnership (CSP) for Norfolk, working in partnership with Norfolk’s local authorities and Sport England to increase participation in sport and physical activity. Another organisation, Sportivate, offers six to eight weeks’ free or subsidised coaching to young people between the ages of 11 and 25, with particular emphasis on individuals with a disability or from a low-income family. The club’s key aim is to encourage youngsters in the sport. The provision of range facilities for scout groups – the main source of new members – plays an important role in the progressive development of the club. Mike Kirkham hopes that it won’t be too long before young Norfolk target shooters are competing at an international level. The NWRPC, which is open to members from 10 a.m. to 9 p.m. 364 days in the year, had over 5,500 visits from members in the last 12 months. If you are interested in becoming a member, contact Oliver Crysell (Chairman) on 01692 581997 or head to http://www.nwrpc.co.uk for more information. To find out more about Active Norfolk head to their website.